If you return each year and follow the guidelines of the way we hunt here, your walls can decorated with trophys of your success. One of the Resorts Best. This picture does not do the deer justice. Our terrain and forage produces large body animals. For example an 8 point buck could average 180 lbs dressed, a 10-16 point buck dressed could weigh up to 300 lbs or more. This is what hunters are coming for the massive buck. Our whitetail deer instincts are formulated by there predator, like the wolf than where they eat or drink. There is an ample food and water supply thoughout the bush. Hunting pressure is minimal. The local MNR office estimates that we only harvest between 1 - 2% of our whitetail population each year. It is well known that many huge bucks die of old age without ever seeing a human. If you have the patience the skill and the right conditions you could be in this photo, it doesn't have to be some else. This is a gun or bow hunters dream. Hunts for bow hunters start Sept 15 through November 15; gun season starts the first Sat of October through November 15th. You could easily do both. We are hunting on over one million acres of government land. Over 80% of our hunts are done on islands and peninsula that are on our Lake of the Woods or Crow Lake. To grasp the tremendous mass of area we are hunting, you should first know this. Lake of the Woods has over one million surface acres of water. Over 14,684 islands, more than 65,000 miles of shoreline; Crow Lake is a 30,000 acre lake. Fact is, we need not ever hunt the same island or peninsula more than once. Providing every group that hunts with us, fresh untouched or previously disturbed trophy white tail opportunities. Ontario Whitetail hunt has consistently and will continue to produce heavier bodied (largest body size in North America) and large racked deer. They are plentiful here. Racks ranging from 10-20 points are not uncommon. Field dressed, these deer are weighing from 225 to 300 lbs. The deer range from 130’s to mid 170’s typical, 165 to 250 non typical. Ontario Whitetail hunting hosts the second largest population of whitetail deer in all of Canada! We have a mix of terrain-from high rocky, heavily treed ground to low swampy areas and beaver ponds. There are over 1 million acres of boreal forest surrounding undoubtedly the finest forage, cover and protection that make for bigger, older deer. This is the best place for reclusive old bucks to get away from the hunting pressure. This is perhaps the finest, true Ontario Whitetail hunt left in North America. You must be in relatively good shape, as you may expect to walk 2-8 miles a day. Meals: Dinner the night you arrive, breakfast the day you depart. During your stay we start breakfast an hour before day break and serve dinner an hour after sunset. Help getting animal back to camp. 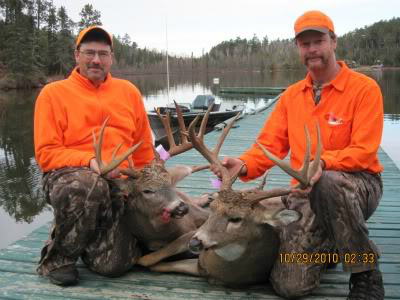 Ontario Whitetail Hunt Rates This five day hunt is only $1700.00 per hunter. There is a healthy population of wolves in Ontario January to March is the time for hunting timber wolves Wolves are an elusive predator and stay away from human populations. Wolf is fast becoming one of the most prestigious big game animals in Ontario. Due to our remote northern location and the vast amounts of wilderness to the north, careful management by the Ontario Ministry of Natural Resources ensures a safe sustainable harvest with no threat to the overall population in the region. If you plan on coming up to hunt wolves, be prepared!. Ensure you dress warmly and that you plan each day in the bush carefully. These beautiful and extremely intelligent animals are very wary of people. Timber wolves are abundant in Northern Ontario so your chances of success are very good. Accessing hunting areas is done by snowmobile or ATV depending on the terrain. We will assist you getting to and from the best hunting spots and help with daily planning and hunting strategy. Experience this unique activity with us at Muskie Bay Resort. To harvest a wolf you need to buy an additional Small Game License and a Wolf Tag. You will need to register your firearms at the border, there is a 25.00 CN charge for up to 3 firearms. $1400.00 per hunter US $ Includes 5 day 6 night hunt. Guide, meals, bait and lodging per hunter. We are very excited to offer a fall Ontario Black Bear Hunt in Northwestern Ontario at Muskie Bay Resort. This exclusive new allocated territory is for guests only. Our guides have many years of experience, we have a large population of black bears. With this new territory that hasn’t been hunted we believe will produce large bears. 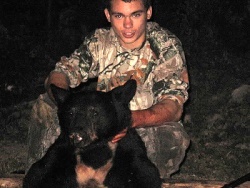 We offer a guided fishing addition to the Black Bear package. 5 nights stay, 3 daily meals served in our main lodge dining room or packaged and delivered to your cabin to accommodate your hunting schedule.